Okay you guys this is a big one!!! 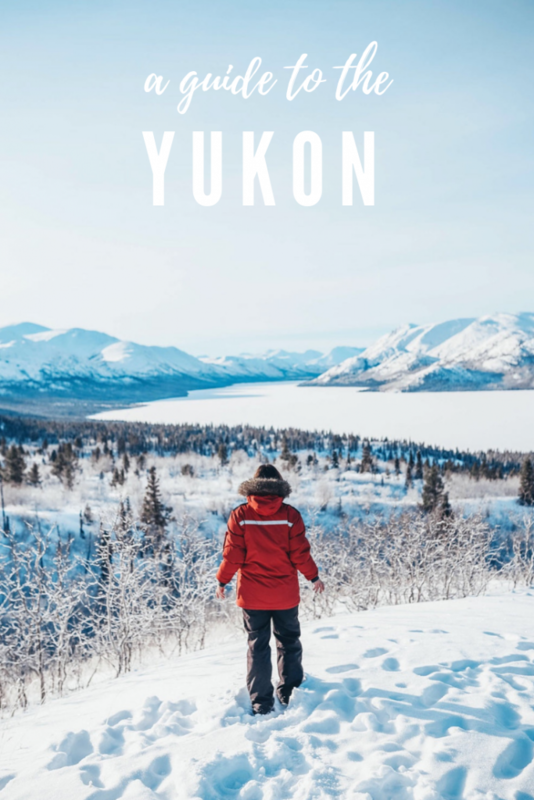 But given that Yukon is big in every sense (big mountains, big lakes, big views, big sky), it only makes sense that this guide has to capture it all! It’s shocking to me that we were only there for a couple days because as you’ll see in the vlog and guide below, we did a lot. We took off to experience the #TwoHourTradeIn with Travel Yukon – I’ll chat more about how to get up here but in short, the flight up to the Yukon from Vancouver is actually only two hours which blew my mind! 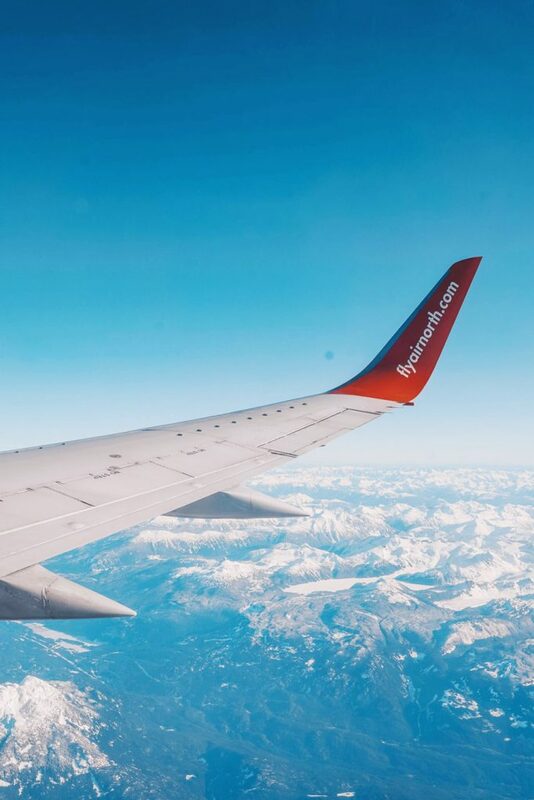 Basically, from now until February 17th, you can enter to be one of 10 winners who score a pair of round-trip flight with Air North from Vancouver to Whitehorse – enter to win here and then read on to discover exactly what you need to do when you get up north! As you guys can see from the vlog, I got to bring my little bro which was so special because he’s been talking about making a move up north for awhile. He’s not a city guy at all and has always craved a more tight-knit, smaller community – I’m pretty sure he’s found his new home up there. A lot of people (both who’ve grown up in the Yukon or who have moved there!) said that there’s something about the north that gets into your bones, and I definitely saw that happen with my little brother. 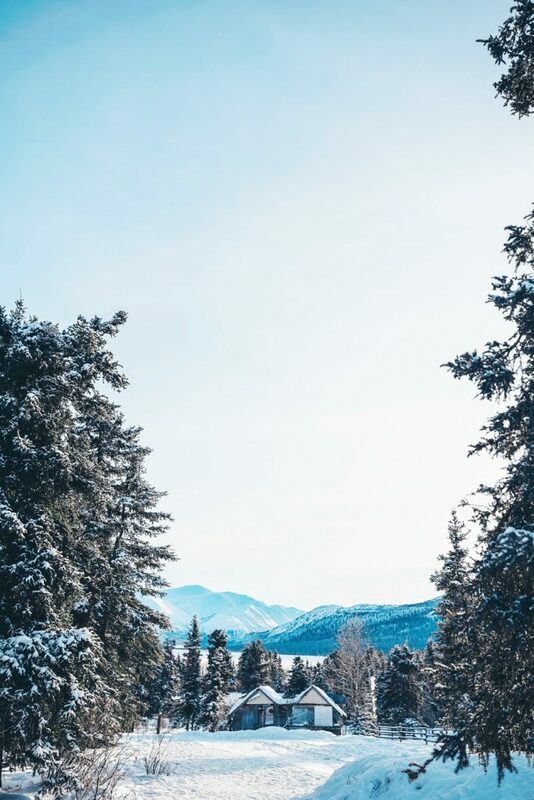 Even being pretty settled here in Vancouver, the magic of the Yukon definitely wove its way into my heart and I 100% will be making this a go-to destination of mine from now on. Read on to see why! 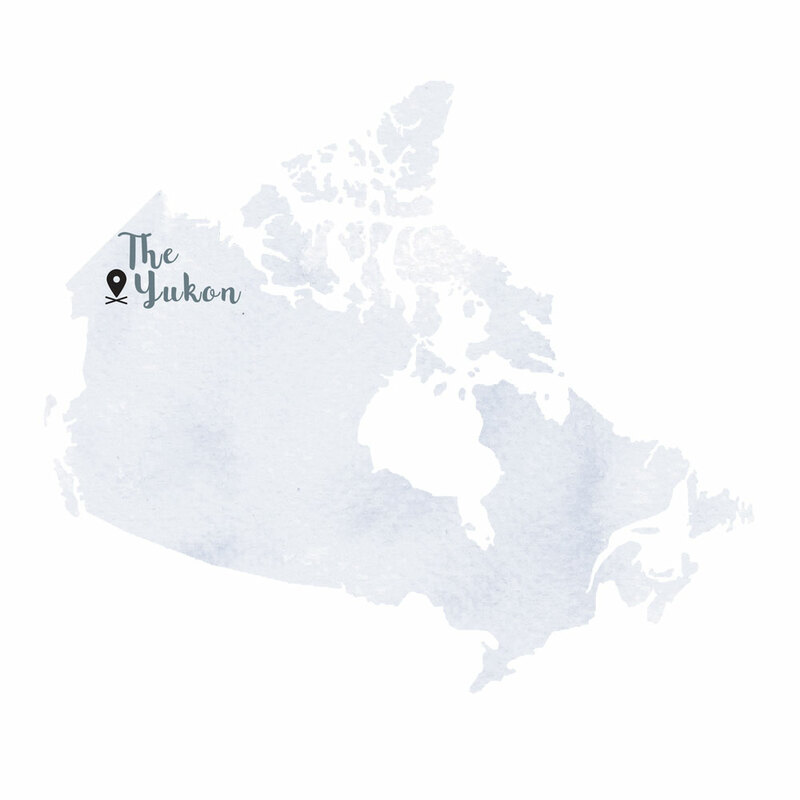 If you’re unfamiliar with the Yukon (or just “Yukon,” it technically doesn’t have to be prefaced with a the I just feel like it sounds more natural for some reason that way! ), it’s the most westerly territory in Canada. The other two territories moving west to east are the Northwest Territories and Nunavut. If you’re not from Canada and don’t get the whole province vs territory situation, it basically comes down to technicalities: provinces were created from the creation of the Constitution Act (in 1982) whereas territories were created by federal law and have powers delegated to them from the Parliament of Canada. In a more general sense too, the territories are far less populated (most of Canada’s population sits on the US border, like Vancouver does!) and cover a vast territory between the three territories. They’re also obviously subject to specific northern climates, whether it’s darkness in the winter (and the obvious cold & snow that comes from being so far north) to a phenomenon known as Midnight Sun in the summers, where you’re pretty much getting daylong sunshine. While a massive road trip could definitely be doable, if we’re talking about a trip from a major city, flying is the way to go. 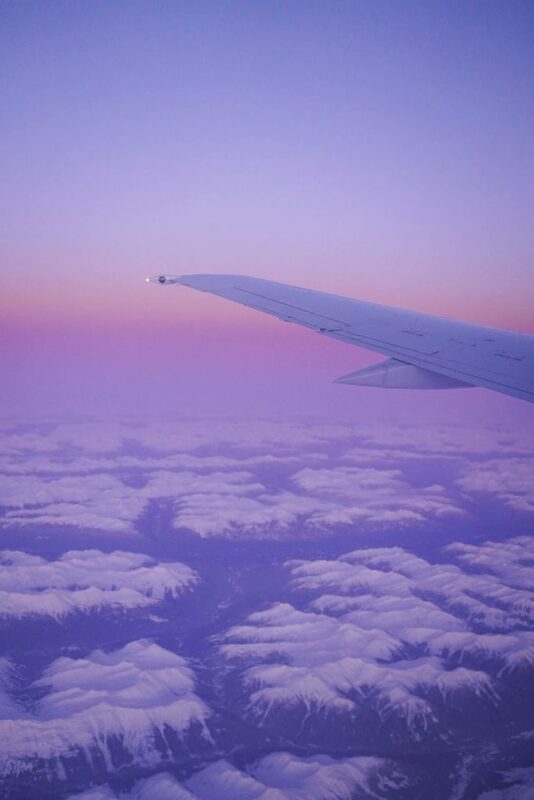 The easiest way as mentioned above is to fly from Vancouver to Whitehorse (or Dawson City, which is about a 6 hour drive north of Whitehorse and is famous as the centre of the Klondike Gold Rush!) 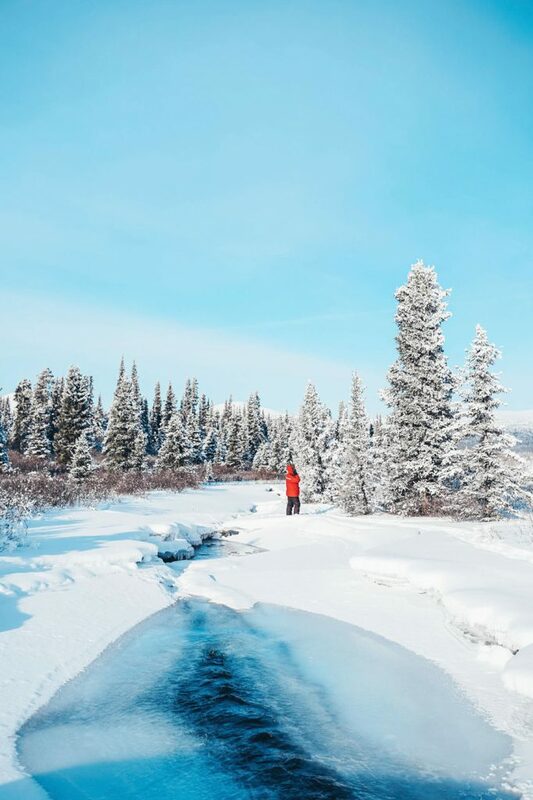 – before this trip, the Yukon seemed like such a long trek away, so naturally I was really surprised and excited to hear it’s only a 2 hour flight away! Speaking of the flight, Air North (the Yukon’s airline) is all about Northern hospitality and they couldn’t have made us feel more comfortable. From freshly baked chocolate chip cookies in-flight (they were so tasty, seriously craving one right about now) to complimentary meals up in the air, they take their customer service to another level. 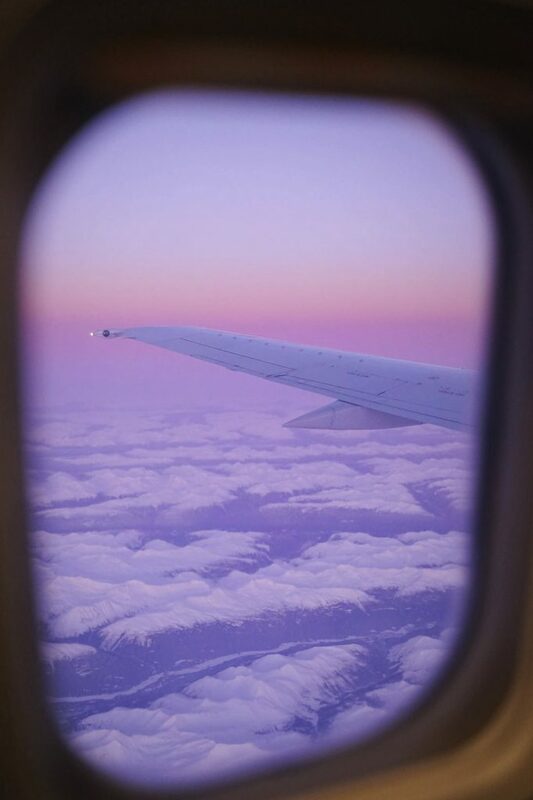 They also were beyond friendly, we got a complimentary checked bag, the flight was a breeze and as an added bonus, the Whitehorse airport is only 10 minutes from town, so all in all it was the most seamless, lovely experience. 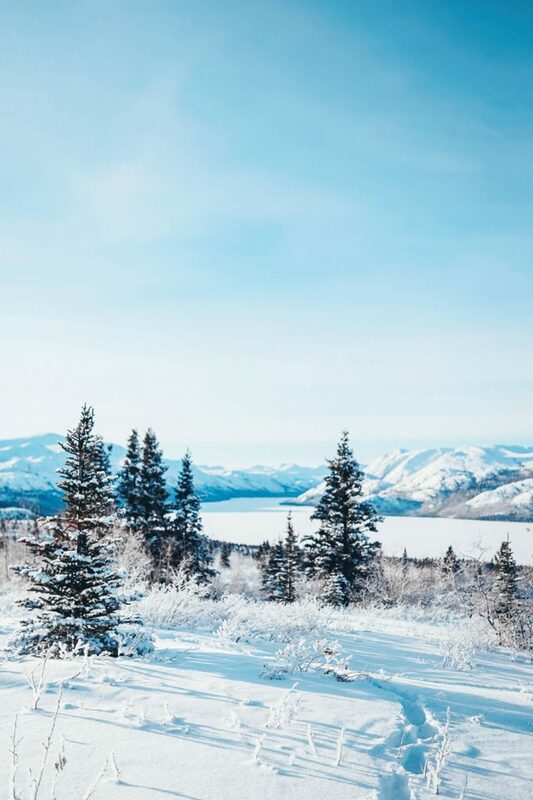 Whitehorse is the territory’s capital and largest city, so it’s a great launch point to experience the surrounding areas and more of the territory. You’ll want a car if you’re planning on doing any exploration up here because while there are some seriously amazing tours (more on that in a bit), to head off to Carcross (an hour’s drive away) or to explore Dawson City (a 2 hour drive away) requires a little road tripping, not to mention if you really want to explore and do a road trip to Alaska or head to some of the more remote Northern communities! We had a car with Driving Force and they were fantastic. 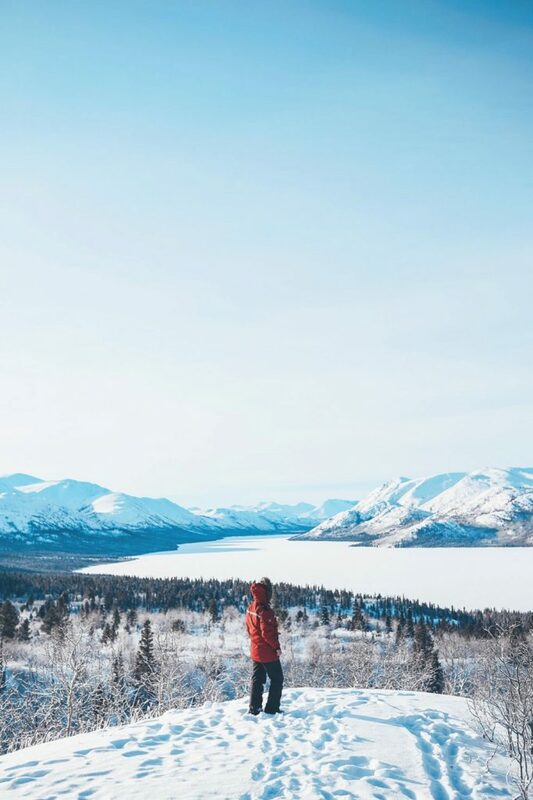 A parka: same thing – any parka will usually note what temperature grade they’re in so pick one that goes as low as possible because when we were up there, it was absolutely – 30 in the mornings and in the evenings and this will be your main line of defence! A thin puffer for layering: I had two (one from Jackets for Jasper, another from Roots) and they were lifesavers. 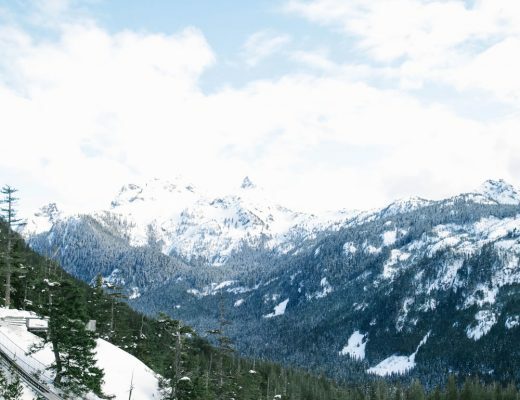 A parka shouldn’t be your only go-to – always remember to look for thin, warm layers. 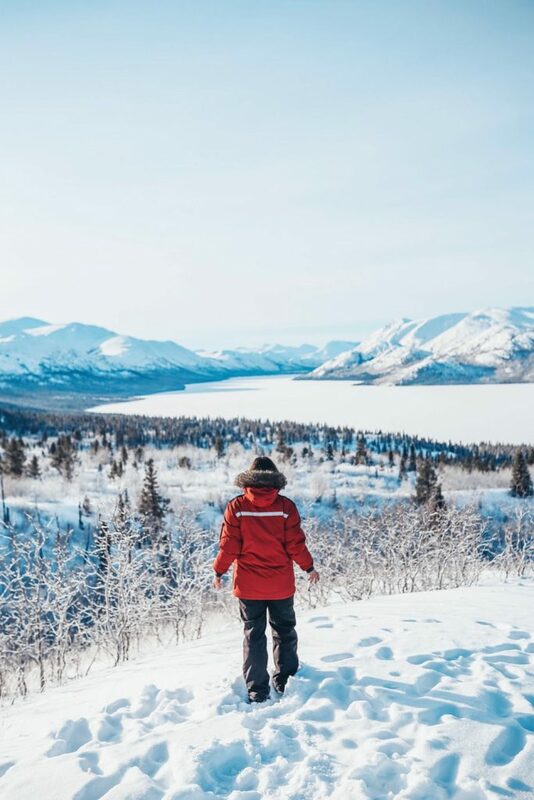 Snow pants: if you’re doing dog sledding or snowmobiling, you need snow pants – having said that, our tour group provided really solid gear so technically we didn’t need it, but either ensure your tour group has this gear available or bring your own. Either way, I’d probably feel safer with my own gear just in case, plus it comes in handy for other activities (hikes in the snow, fat tire biking, even being out late aurora viewing). 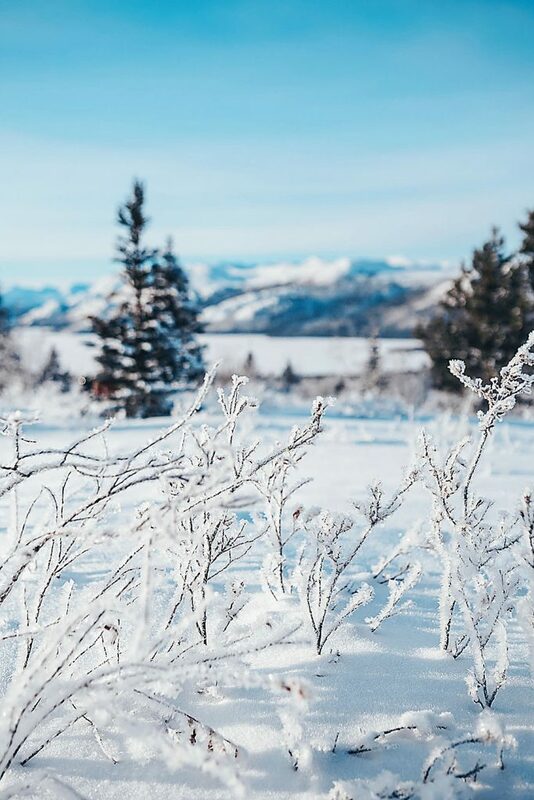 Tech gloves, scarves & toques: I lost my tech gloves on our first day and really wish I’d brought a backup because even just taking off my gloves to take one Insta Story froze my fingers in the AM’s and in the evenings! Also, you obviously need to keep your head warm – bring lots of toques, and scarves as well. One thing I found on this trip in particular is because I was so bundled up, I kind of wished I’d had a smaller scarf that could just go around my neck specifically since it was a bit much having it stacked on top of my 6 layers on top! Silk or thin wool leggings: to wear underneath your jeans, snow pants, etc. They add zero bulk but really help keep you warm. Little heater packets: you can get these at Home Depot or any hardware store, snowboarding store, etc. You won’t need them during the day but I really wish I’d had some to slip into my boots when we were aurora viewing at night with no sun to warm us up! 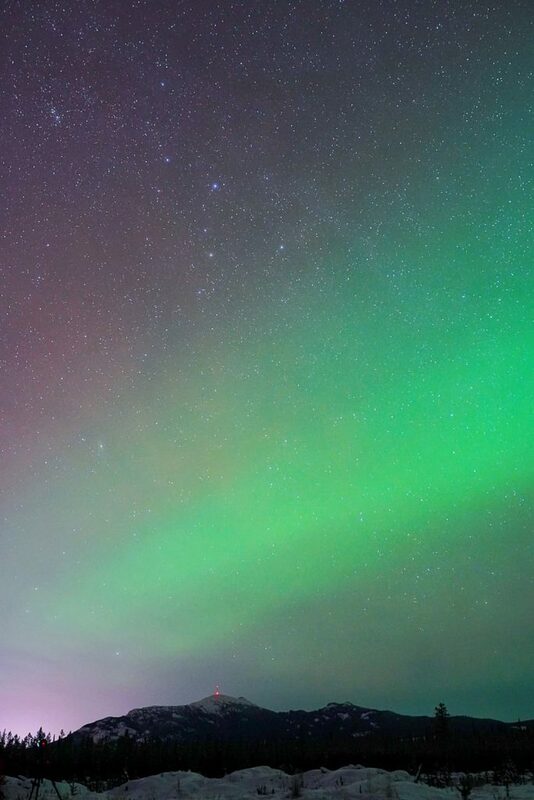 A tripod: read on to the aurora section and you’ll see why! Really, the question is not what to do but how to narrow everything down to a manageable few to-do’s! There are so many amazing things to see up here even in just the surrounding Whitehorse area alone, so I’m sharing first the things I did/the place I’ve visited (which were by the way some of the most unbelievable experiences I’ve ever had in my life) and then touching quickly on some additional activities that we sadly couldn’t get to but would love to next time! 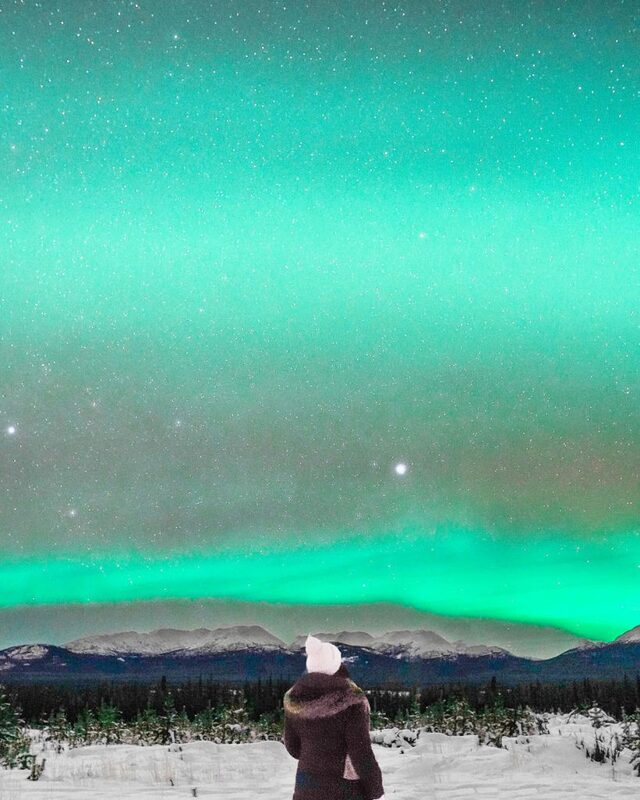 It’s a pretty surreal, once-in-a-lifetime kind of experience to not only see the aurora glow on the horizon (which is already beyond cool in and of itself), but to see the whole starry night sky literally light up with dancing aurora borealis, moving across the sky in vivid green waves. The fact is, seeing aurora like that is rare so I don’t for a second take for granted how unbelievably lucky we were this night to experience it this way. Aurora are elusive, and while there’s always a really strong chance of seeing them in the Yukon, you have to factor in weather, location, timing, etc. 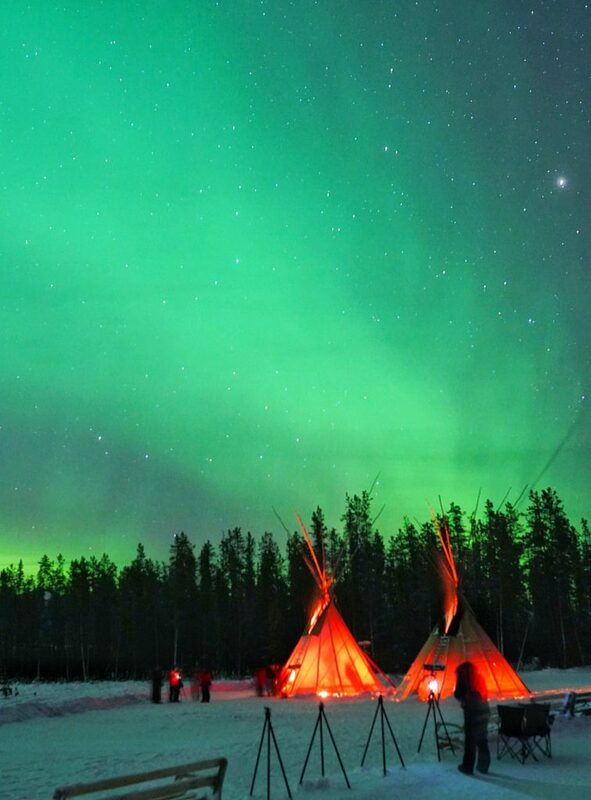 That’s why I was so happy we went with Arctic Range, who not only really knew their stuff (and brought us to this unbelievably cool camp, complete with yurts, teepees, smores, fires and tea) but showed us how to use our cameras to actually capture what we were seeing. If you get a chance to go with the super sweet Jonathan from New Zealand, he was unbelievable – he spent a lot of time helping me get my camera set up and when I got back to my hotel in the early hours of the morning, I was blown away by what was on my memory card. Thank you Jonathan! I’m so grateful I got to experience this, it was honestly something I’ll always, always remember. One thing to remember: bring a tripod! If you’re planning on shooting these on a DSLR camera, you’ll need a tripod to hold the camera really steady and ideally, a remote control of some kind (I can control my Sony with my phone so used that). Jonathan or whoever is there to guide you along will have more technical tips as far as exact settings but having an absolutely still camera (and if you’re going to be in it, subject) is the name of the game! 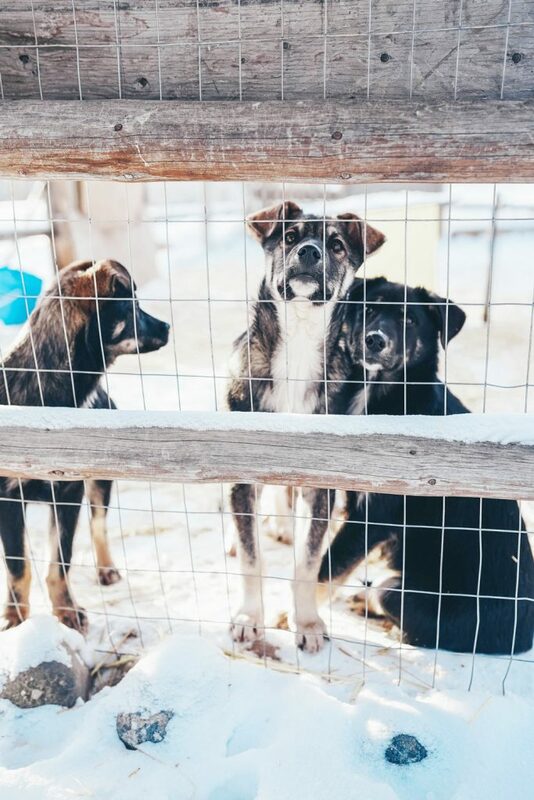 We got to go dog sledding with Up North Adventures and wow – seriously, another lifelong memory. 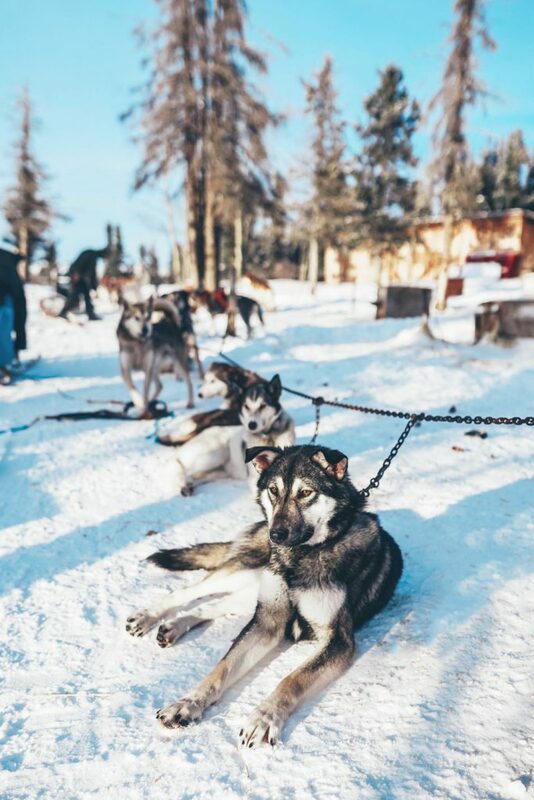 I didn’t know if we’d get to mush our own sleds or just ride in them so I was super happy to discover we were actually going to be mushing our own sleds when we got up to Sky High Wilderness Ranch, where all the fun was taking place! If, like me, you don’t really know what goes into dog sledding, I’ll tell you right now: it’s a workout!!! It’s basically equivalent to learning how to ski for the first time. You’re riding on these two tracks on the back, jumping off and running behind the sled when going up steep hills, jumping back on and having to really throw your weight behind brakes to slow down the dogs on downhills, jumping over to one track to kind of kick along with the other foot on the snow to give a bit more speed, having to squat and balance on turns, etc. I love active adventures so it was honestly more amazing and fun than I anticipated! 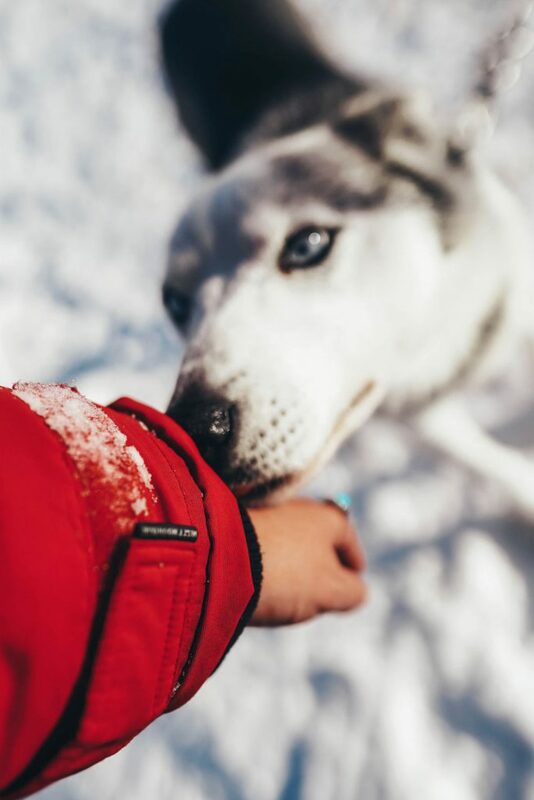 It’s also just such an incredible thing to experience – it’s just you, your dog team and a sled. 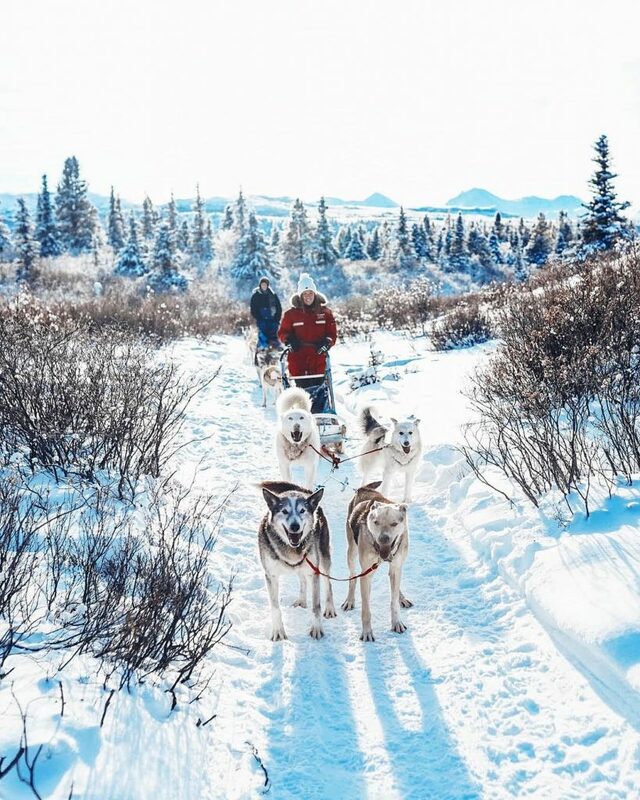 No machines, no technology – just your little team gliding through this unbelievable winter wonderland. A. Must. I was really excited to snowmobile but I didn’t actually expect to love it as much as I did. Like dog sledding, I thought it’d be more of a passive experience – I was really trying to push my brother to do fat tire biking since I’m a big biker myself, but he suggested snowmobiling and I’m so glad he did. First of all, like dog sledding it’s actually a bit of a workout if you’re new to it! 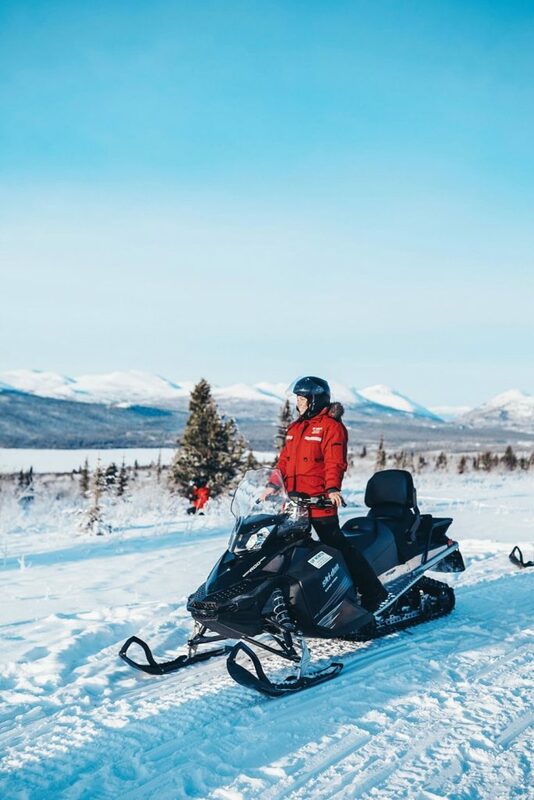 You have to really turn the snowmobile, use your arms continuously, use your legs and core to circumvent jarring your body on the many bumps along the way and even catch a little air here and there! It was so much fun and honestly, even though I’d say I’m a bit of a speed demon on something like my bike, I was by far the slowest of the group and still felt like I was ripping it through the snow. Super thrilling. 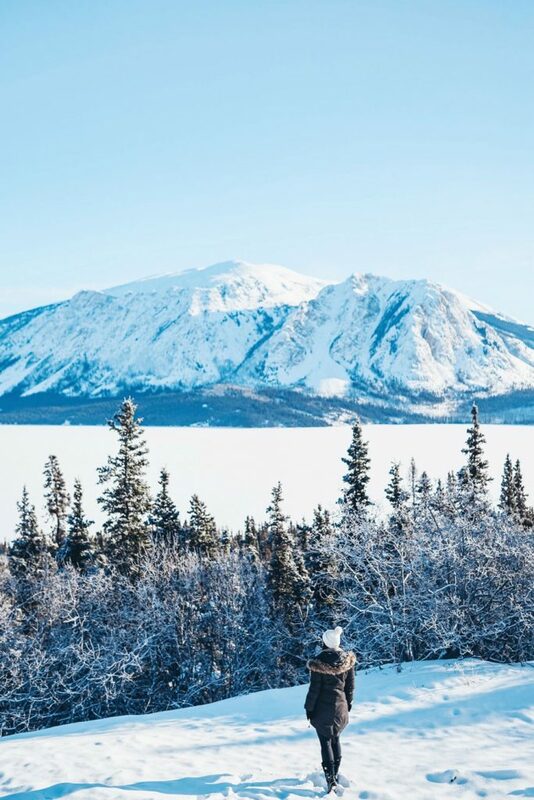 I also didn’t anticipate getting to have such unbelievable views throughout our snowmobile tour. Our guides were so amazing this whole day, and even our lunchtime at base camp was such a cool experience – we had chili and hot dogs in our yurt, which reminded me of the tents in Harry Potter in that they were kind of unassuming from the outside yet once you open the door, a whole very sophisticated set-up on the inside! I would 110% recommend booking with Up North Adventures, they were fantastic. Miles Canyon (pictured below) was a super easy and lovely stop on our first day as well – the road itself was barred off so we had to walk down from the highway, but it was really not a far walk and so worth catching it in time for the sunset. 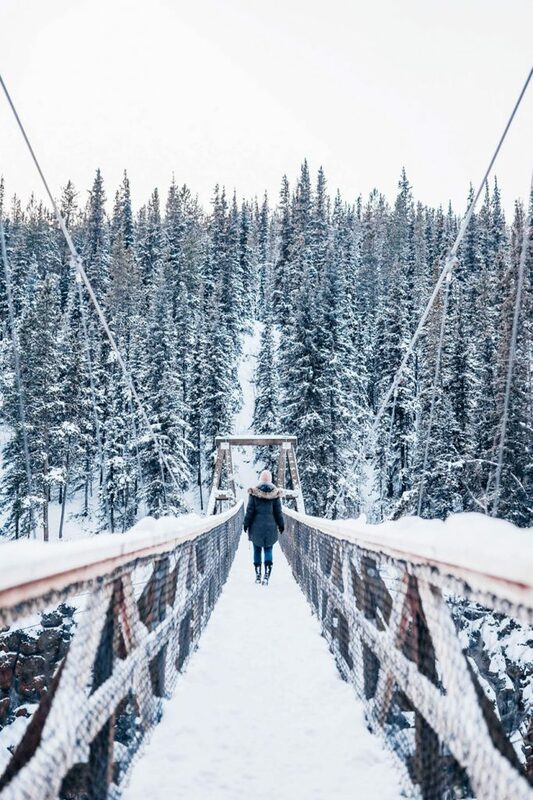 I’d imagine this is just as gorgeous in the summer with the turquoise waters flowing through here and its gorgeous suspension bridge! 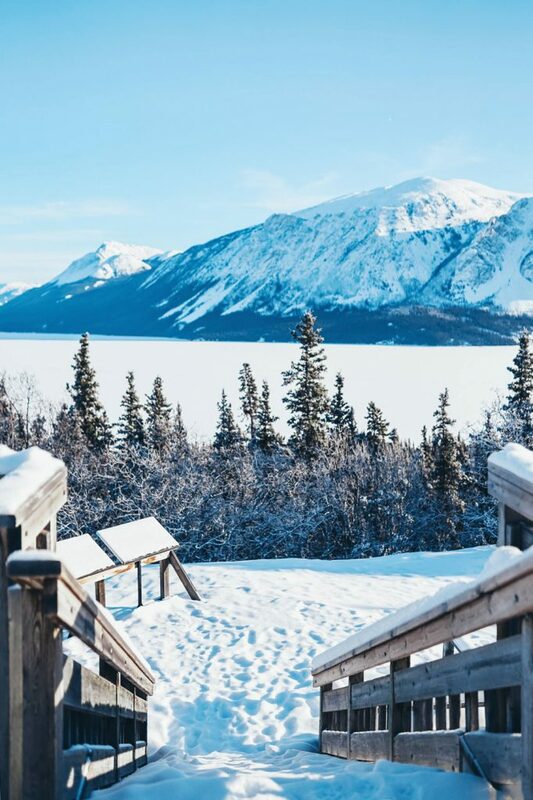 Finally, we also did a little day trip down to Windy Arm and Carcross (pictured below) which are super close to Whitehorse and provide amazing sweeping views of the mountains and lakes in this area. There’s also Emerald Lake which was iced over but apparently gorgeous in the summer! 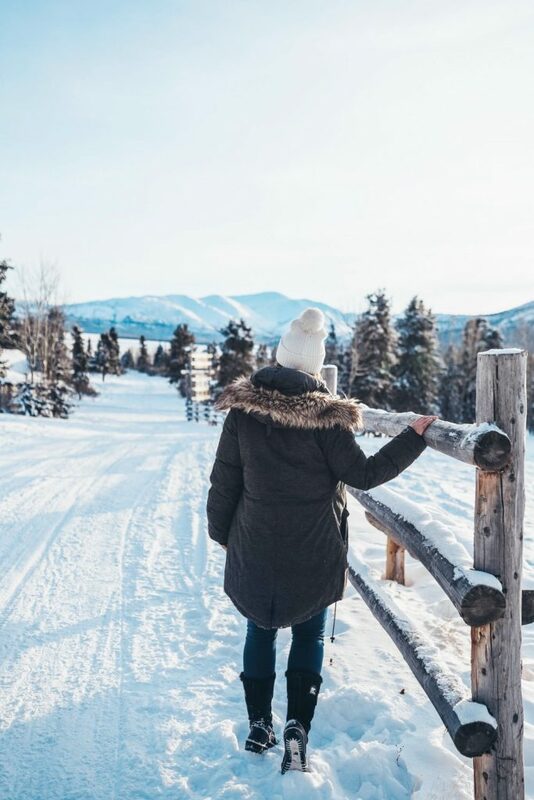 While we couldn’t get to these activities, they would all be amazing wintertime things to do depending on your interests, activity level, trip time and more! Always an important category! 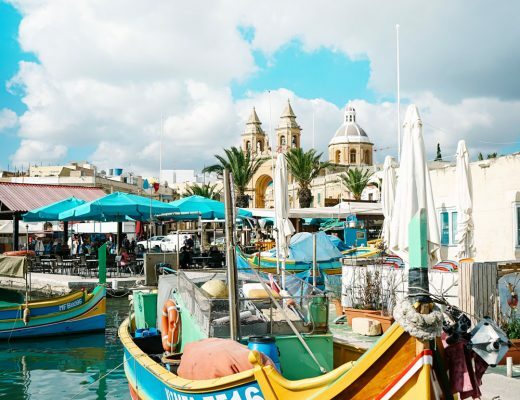 We were really delighted to see that there were so many incredible places to eat here. 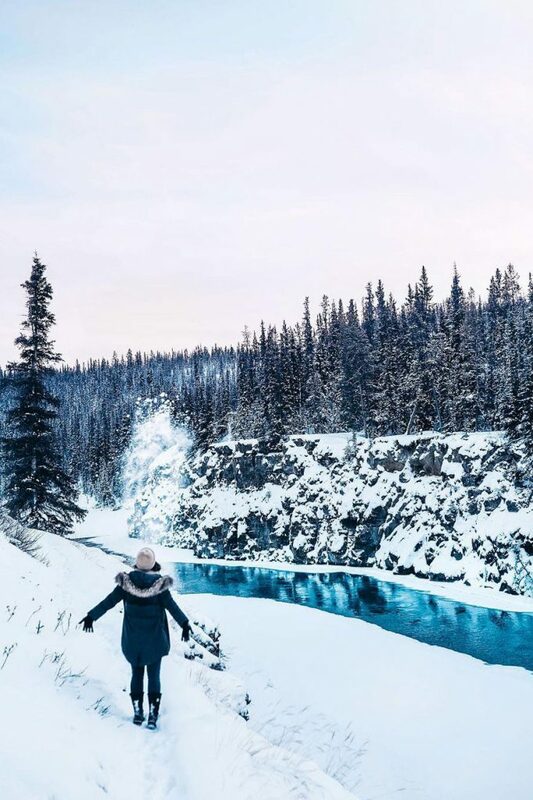 We both found that the cuisine was a lot heartier than the very coastal cuisine we have in Vancouver, which is just what you want when you’re outside in the cold all day – I found myself way hungrier on this trip, not only because I randomly burned 4000 calories according to my Fitbit on the dog sledding/snowmobiling day, but because I think the cold in general just ramps up your appetite! Here are some of our faves from the trip. 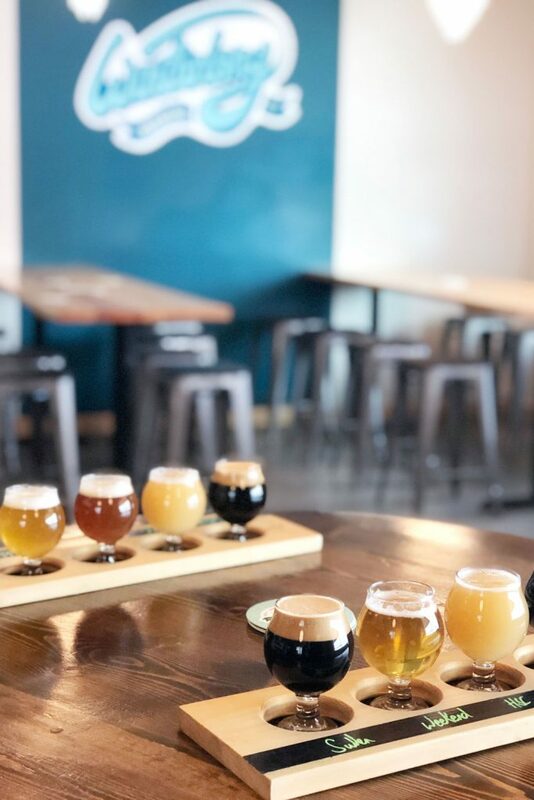 Winterlong Brewing: we love, love, loved this place – if you like beer, this needs to be a must-visit. We liked it so much we each brought a couple bottles home – Matt is now a big fan too! Baked: a great spot for tasty baked goods in the AM and amazing coffee, which is always the first thing I locate whenever I’m travelling somewhere! The Dirty Northern/Miner’s Daughter: these two connected joints are a great spot for either a cocktail and appy or a meal. We had super tasty burgers here! Burnt Toast Cafe: a lovely casual joint for breakfast – we needed a solid breakfast before our little Carcross road trip and this served up in spades! The Woodcutters Blanket: a beyond lovely local spot for cocktails and a delicious meal. 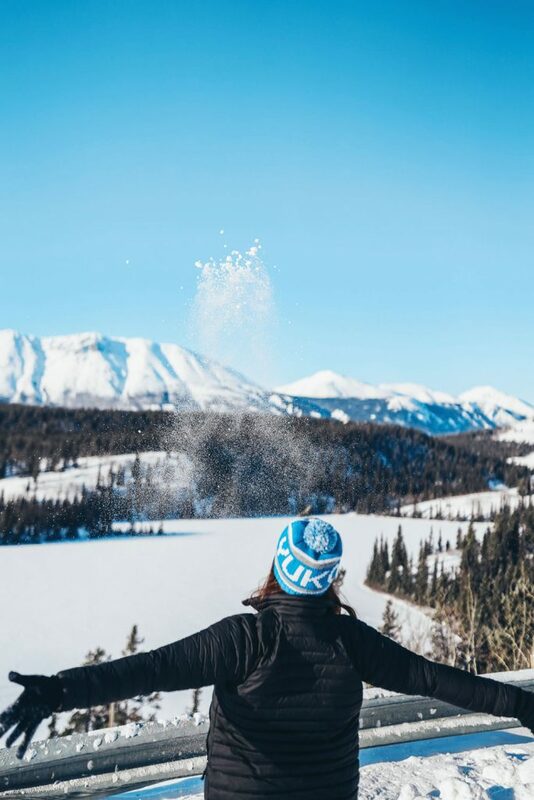 Yukon Brewing: while we both preferred Winterlong, Yukon Brewing has been around for a long time and their red ale in particular is not to be missed. 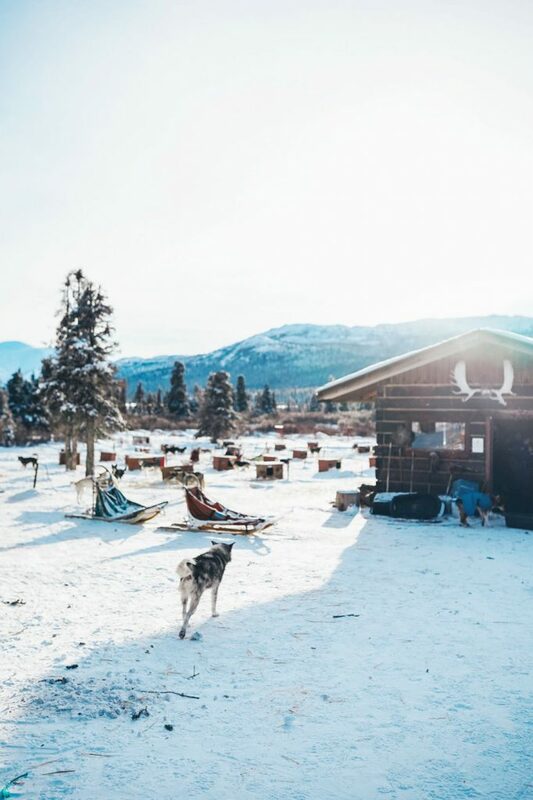 If you’re used to 4- or 5-star accommodation, then just know that the Yukon will be a bit different. Having said that, while technically most of the hotels here are in the 3-star range, they’re seriously lovely. We stayed at the Edgewater Hotel right in the middle of town and it was perfect – they recently renovated and you can really see the way the hotel’s elevated its decor and accommodations. Beds were super comfy, rooms were beautifully decorated and spacious and service was fantastic. You can book with them here! A few more hotels or bed & breakfasts below too! I’ve vetted these all and they all look amazing! Coast House Country Inn: I believe this is where Will & Kate stayed when they came up to the Yukon! 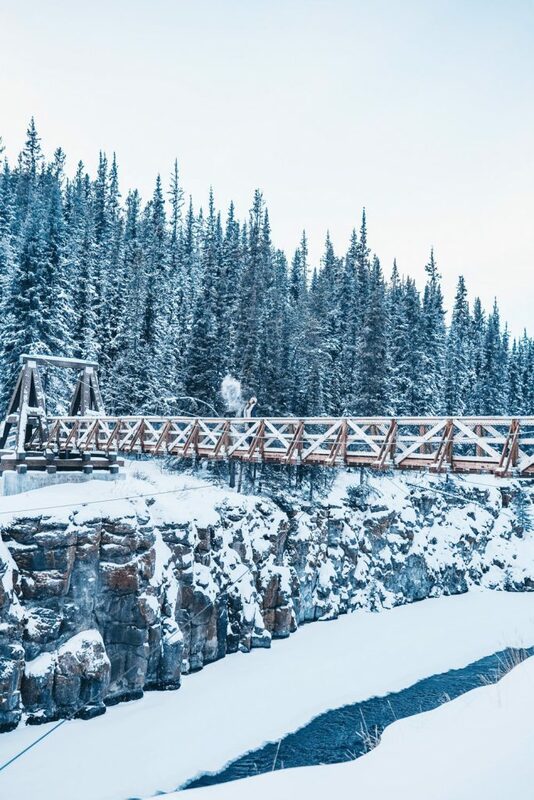 It’s a classic pick for Whitehorse. Book here! Hidden Valley Bed & Breakfast: one of the top-rated places in the Yukon, this looks like such a lovely and homey option for a stay up here. Book here! 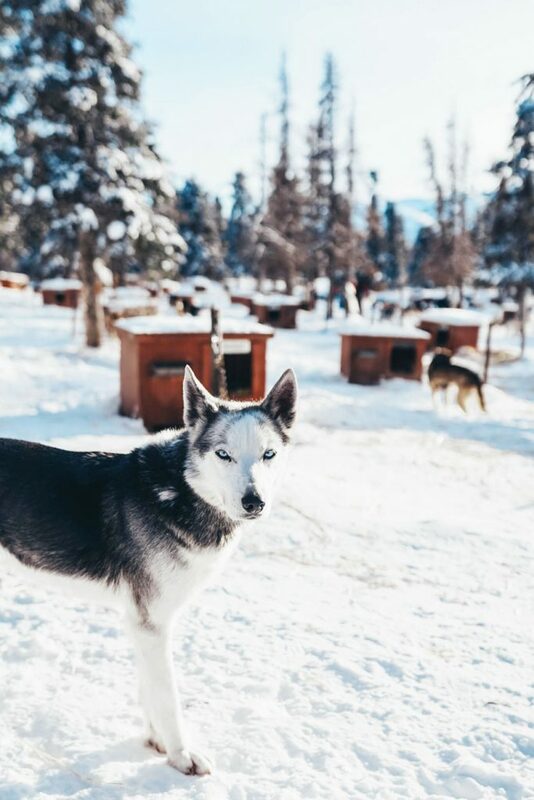 Sundog Retreat: I love the idea of staying at one of these cabins and particularly love how they’ve factored in Yukon’s extreme seasonality into their booking system, meaning you book from two options for winter or summer! Book here! 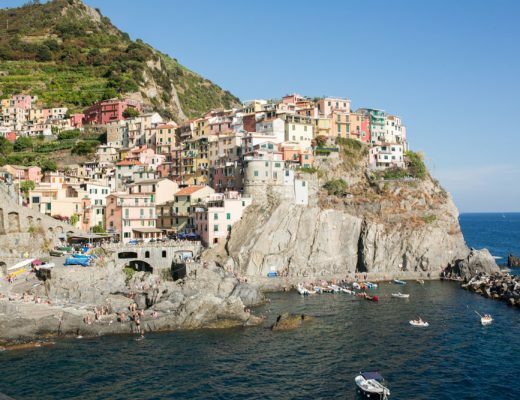 Finally, some Airbnb options if you’d rather do a vacation rental! The Log House ($75/night): how cute is this house?! I love that its location puts you close enough to town but removes you a bit so that you can really disconnect a bit more. Book here! Cozy, Off-the-Grid Cabin ($83/night): want a truly off-the-grid experience? This cabin is where you’d go to get away from it all, plus its location couldn’t immerse you in the wonders of nature more! Book here! Cabin Near Hotsprings ($119/night): if you want to be a little bit more on the grid as far as wifi and other amenities go, this is a perfect option! I love that it’s only a 3 minute walk from the famous hot springs so that you can go for a soak whenever you’d like. Book here! 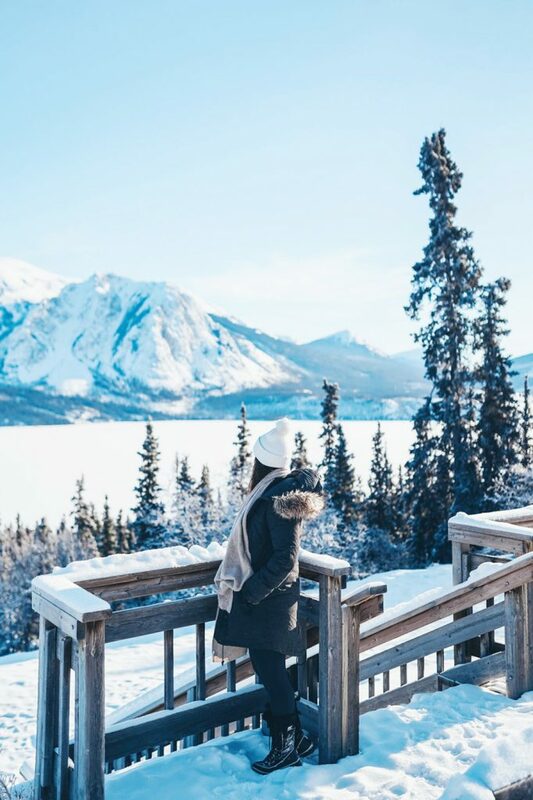 I can’t stress enough how unbelievable this trip was – I was expecting it to be super cool but it was unexpected just how special it was and consequently, how much I fell for this special part of Canada! Being Canadian, one of my goals this year was to see more of our country (which I feel like I’ve been doing a good job of so far, from the Maritimes to Jasper, Alberta to Tofino on the most westerly coast of Vancouver Island in the last 6 months or so!) and it’s really amazing discovering just how easy of a trip it is to this indescribably beautiful and awe-inspiring part of the country. 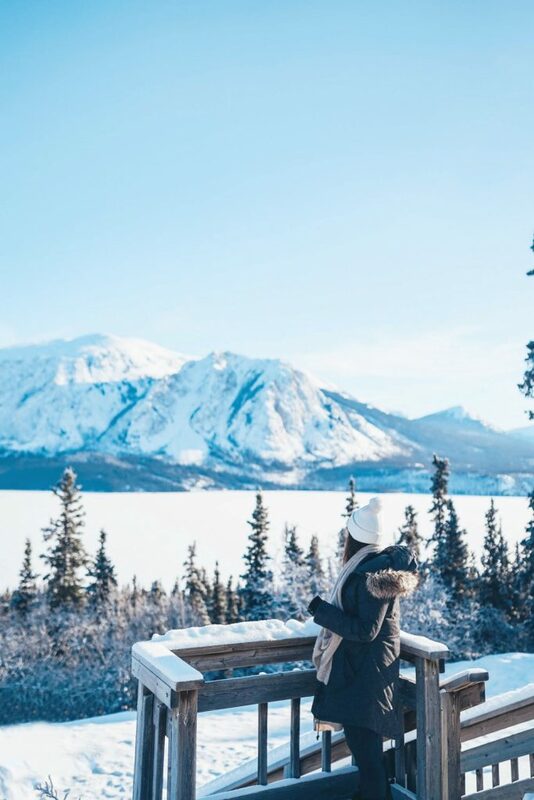 Don’t forget to enter the giveaway before the 17th if you want to experience it for yourself – it’s open to all Canadians (excluding QC) so even if it means you just getting into Vancouver somehow else, you’ll have your Yukon leg covered (plus being from Vancouver, I can assure you you need a Van visit – my hometown is so beautiful!). 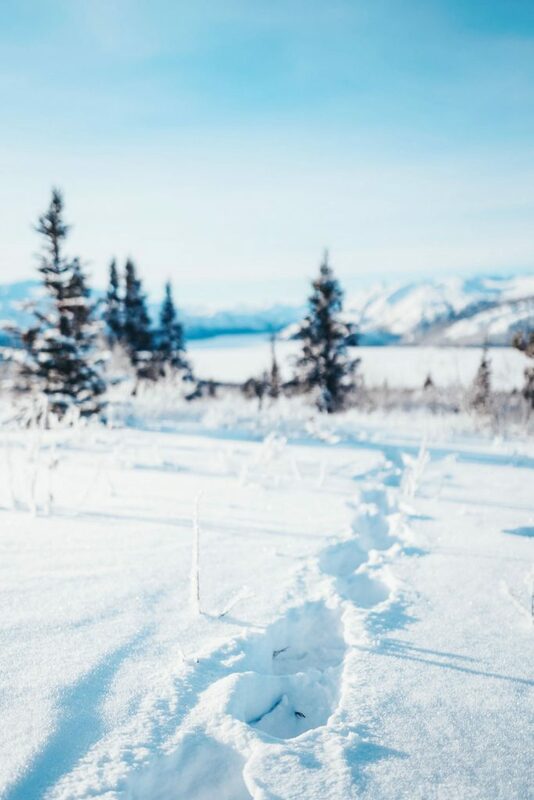 What’s the furthest north you’ve ever been? Tell me in the comments below! Feel free to pin the graphic below to keep this on reference! Ah well you’ll have to go! It’s incredible there! This is amazing! 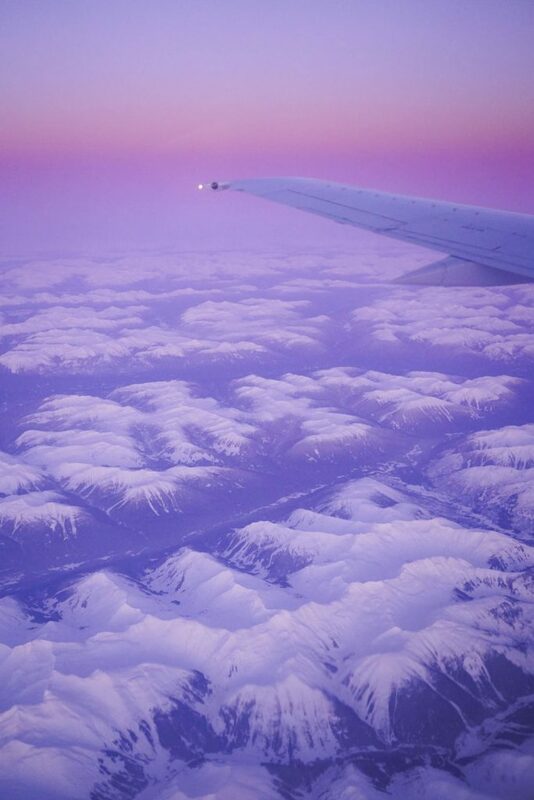 I can’t believe Yukon is so close to Vancouver – it definitely makes it seem a lot more accessible. 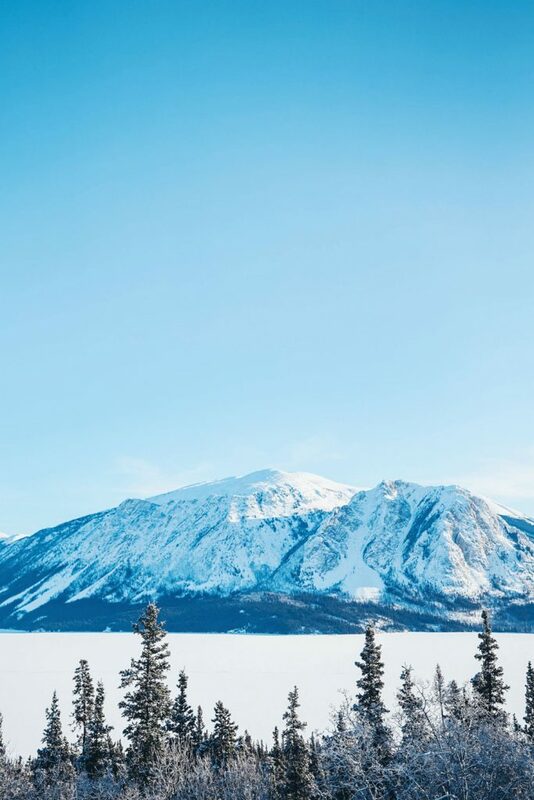 I’ve been to Carcross but it was a stop on an Alaskan cruise and I didn’t really get a chance to fully experience the territory. I’ll have to go back! 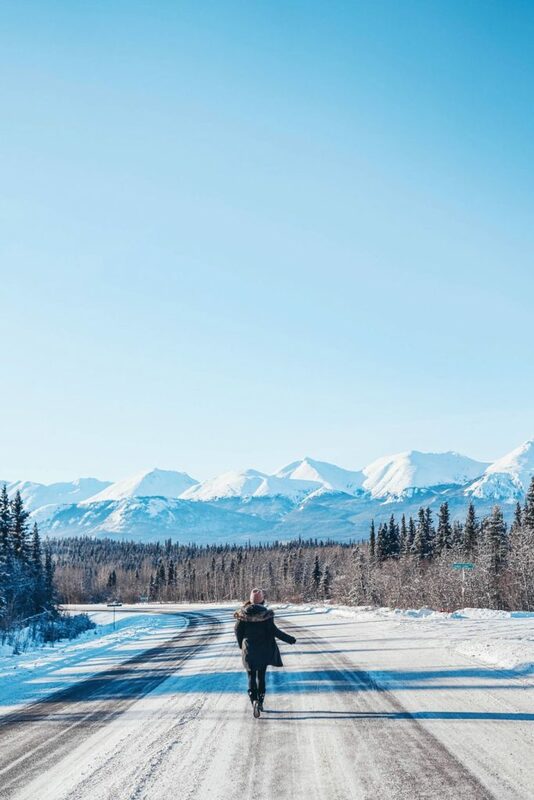 Yukon is the new Banff/Jasper! …without all the people! Omg I haven’t heard that comparison yet but you’re so right! I really want to go back in the summer!